First and foremost, I really need to thank all of you for your feedback, encouragement, and suggestions for this new project of mine. I was floored by the response and even more excited to keep with it after hearing your suggestions. I had ideas ranging from Jane Austen, to Beth Moore, to John Green, to Anne Lamott, and Glennon Milton. 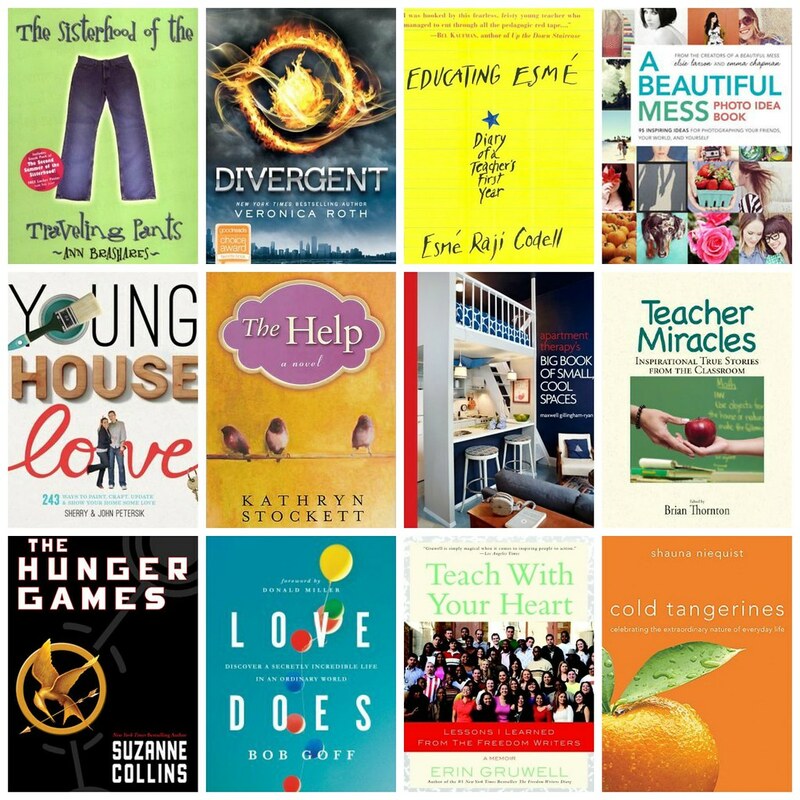 And just hearing about your love for reading and these authors makes me want to go out and buy them all. But I digress. 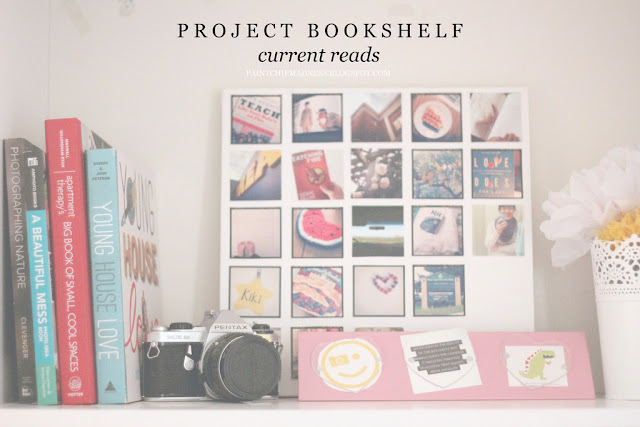 I thought I would start out this project with a look into my current bookshelf status, the books I have right now and the ones that helped kickstart this project. +Love Does is hands-down one of my favoritest books ever. It's one of those books that truly changes your heart and can be read over and over again. +Divergent and the Hunger Games series are both great quick reads that are perfect for a Sunday afternoon. That, and they're also new movie series and they're pretty popular, so if you're into that kind of thing, you've got to get your hands on them. +Educating Esme. I love a good teacher book and love to read anecdotes and other stories that inspire me to become a better teacher. If you're a teacher and have suggestions or want more of mine, let me know! +Cold Tangerines, or anything by Shauna Niequist. I've read two of the three of her books now and am seriously in love with her writing style. If you've never read her books, I would describe them as a bunch of blog posts put into one book. Different life stories with great lessons about our great God and the blessings He's given us. So...do you have any other additions for my bookshelf? I've ordered my books for January and February and cannot wait to get my hands on them and share them with you! And if you're doing a similar project or would like to share a book with me/my readers, leave a comment below! Confirmed: Mindy's book is a go. Since we last talked, I've almost finished it and in my humble opinion, it's worth it. I also loved the Help. And The Help is one of my most favorite movies and such a great read, too! such a fun post kiki! i still need to go through my bookshelf and find some good recommendations for you! I found it on amazon for $9.99, so i might have to buy it! REAL life books are the best.....after traveling around a ton, and moving a few too many times I have often regretted how many books I have- but then I look over at my shelf, and I LOVE my books. Again, thanks for the ideas Kiki! Right now I am re-reading the Francine Rivers series Mark of the Lion- which I highly recommend! And I've never heard of that series by Francine Rivers! I've heard of the author, but not the series. I'm going to have to look into it--thanks for the suggestion! I love your book collection! I really want to read Love Does and I've had the Beautiful Mess photo book on my wish list for a while. I didn't know Young House Love had a book. I'll have to check it out! Kiki, this is such a fun list! And I love that I'm not the only grown up who is still reading the Sisterhood of the Traveling Pants series :) Can't wait to add some of these to my list. I just finished The Lace Reader, which was not as amazing as I wanted it to be but a fun, fast read. Thanks, Amy! As for the Sisterhood of the Traveling Pants series, let's just say that was the series of my teenage years. I was obsessed with them growing up! Have you read the last book in the series (Sisterhood Everlasting)?